Often quicker to acquire C1s region and extend range to 305eV to capture K2p region. 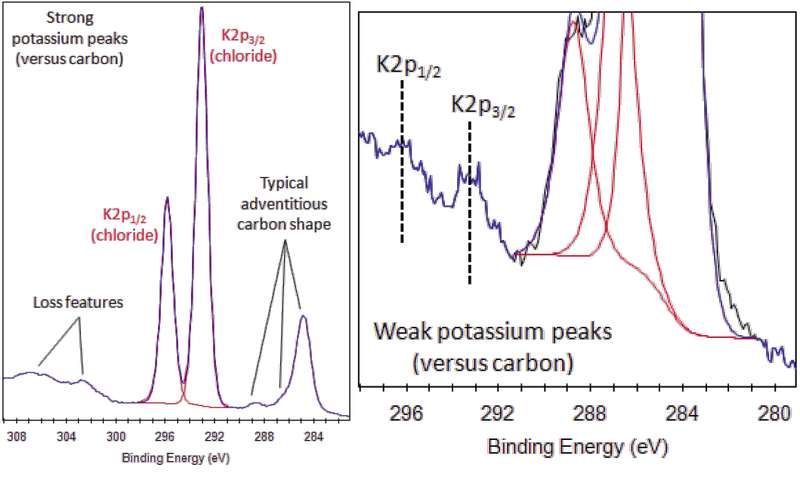 K2p peak has clearly spaced spin-orbit components (Δchloride=2.8eV). Weaker K2p peaks can be easily confused with either C1s (CF2) peaks or C1s satellite structure in aromatic compounds. Assignment of K2p versus C1s feature is possible by identifying spin-orbit components expected for K2p. Also check for K2s peak, binding energy ~378eV. 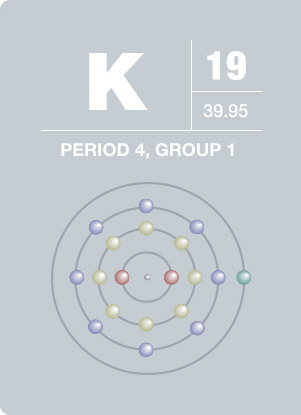 Since potassium is a highly reactive metal, it is always present as a compound, e.g., oxide. Potassium, the second lightest metal, was discovered by Sir Humphry Davy in 1807. It reacts violently with water and can even catch fire spontaneously in water. It can be found bound to other elements in seawater and minerals and is needed for plant growth. Potassium is commonly used in fertilizer. It is also used in gunpowder and glass and plays a vital role in animal cells as one of the partners in the Na-K pump. K-40 decays into Ar-40 and this process is used in the dating of rocks.